Spend an hour talking to one of the several biodynamic wine growers in Alsace, and your head will hurt. It’s not that you will have been beaten about the temples with a dung-filled cow horn; it’s just that so much information will pour forth from these hyper-passionate individuals that you will be reeling from the deluge of facts, figures and thought-provoking comment. 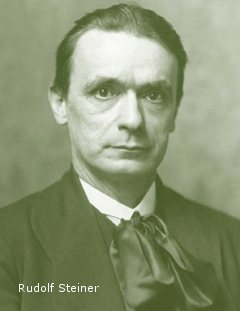 Biodynamics is an agricultural system first developed by Austrian philosopher Rudolf Steiner at the start of the 20th century. It is based on organic farming, but goes beyond the obvious avoidance of chemicals and synthetic treatments, to a much more holistic and philosophical regard for the land. Some of its tenets cannot easily be explained, including farming by a calendar that respects the earth’s magnetic fields and the rhythms of the sun, moon, planets and stars, and working with preparations that seem almost mediaeval: infusions or herbs and minerals, some, indeed, packed inside cow horns and buried underground. I approached this trip to Alsace with an open and willing mind. Alsace has a proportionately huge number of bio producers, and I was told by more than one that this is largley due to the ages of the producers (all children of the 60s and 70s) and the fact that they were so influenced by the Green movement just across the border in Germany. The success of the biodynamic producers since, has persuaded more reluctant farmers to believe in the benefits of the system. But despite the lack of explanation for some of the more esoteric aspects of biodynamics, I did come away from this trip with a much better understanding, and a much more fundamental belief in the system. This came about through the fascinating conversations that I had with the winemakers, from seeing the vineyards, the compost heaps, the preparations and detail of the system, and more than anything, from witnessing the respect and sensitivity that all of these producers so obviously had for the vines and their land. 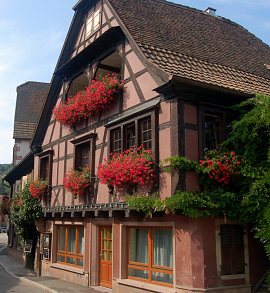 (Left: pretty as a picture, an Alsace village). Some specific thoughts will come up in the profiles that follow, but in these few days I saw overwhelming evidence that biodynamic farming is a ‘force for good’. The duty of care that each grower so obviously feels for the land, and the most sensitive relationship they have with their plants, is remarkable to see. If biodynamism is about anything it seems to me, it is about observation, gentleness and sensitivity. And with respect to agriculture and nature, that is a powerful force indeed. For a closer look at some of biodynamism’s treatments, please see the quick guide to biodynamic preparations and practices. I met with Olivier Humbrecht twice on my trip: once at the domaine as we tasted some young wines and toured the vineyards, and once in the excellent La Palette restaurant in Wettolsheim where we enjoyed several glorious older bottles. Instead, as with so many aspects of his viticulture, Olivier observes his vines, watching the pattern of growth and bud break, pruning the wood and training the vines so that yields fall naturally into place as vines age. In other words, he tries to work in harmony with the plants rather than any more brutal forcing of nature’s hand. This philosophy extends to the cellars, where the vineyard dictates the style of each Zind-Humbrecht cuvée, and variations in style between vintages can be marked. 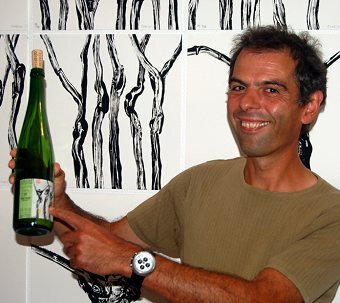 Many Zind-Humbrecht wines have high alcohols – 16% is not uncommon – but Olivier insists not only that this is the natural expressions of his vineyards, where fermentation uses ambient yeasts, but that his concern is the overall balance of the wines, not purely the alcohol, sugar and acid numbers. Managing Director Christophe Ehrhart showed me around the busy facilities of Josmeyer in the village of Wintzenheim. Josmeyer is a fairly large producer, with 25 hectares of estate vineyards, supplemented with grapes from a group of neighbouring farms, all certified as organic growers. Like others on this trip, Josmeyer’s wines are certified by the French Biodyvin organisation, though others have allegiance to the Demeter international body. Josmeyer has holdings in the Grands Crus Hengst and Brand, amongst no less than 42 different parcels of nine different grape varieties, giving Josmeyer a broad palette of terroirs. The Josmeyer style contrast hugely with Zind-Humbrecht, the wines being dry and relatively lean in style, made to be drunk with food (owner Jean Meyer is a renowned gourmet) where they really blossom. Josmeyer’s commitment to sustainability and the health of the land seems paramount in their approach to viticulture. Christophe talks of absorbing the “forces of life” that were “mobilised” in the production of the wine, and owner Jean Meyer (Christophe’s father-in-law, and busily scurrying between winery and bottling plant on my visit) is on record as saying: “I have been eating biodynamic vegetables for years. They are not always the prettiest, but they always have the most flavour. This is what I want from my grapes: I used to make my wines in the cellar. Now I make them in the vineyard.” Pol Roger brings Josmeyer’s wines into the UK. 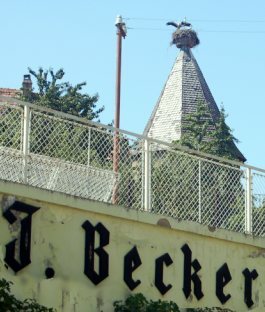 The Becker family have been winegrowers in the village of Zellenberg since 1610. Today’s generation of Beckers includes my host, Martine Becker, who showed me around their ancient cellars. 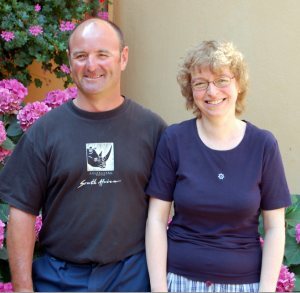 In 1999 Martine’s brothers Jean Philippe and Jean François Becker (winemaker and viticulturist respectively) converted the 14-hectare estate to organic farming, and later adopted biodynamic principles, though they are not yet certified. This is a common theme in Alsace, where ‘biodynamic fever’ has gripped the entire winemaking scene: amongst the non-certified estates, organic farming and adopting pick ‘n’ mix components of biodynamic practices is almost universal. Though undoubtedly there must be some who are leaping on a bandwagon, many, like Jean Becker, are simply using their intelligence and generations of knowledge of their vineyards to adapt biodynamism so that it works for them. Some vineyard sites have specific conditions that mean relying only on biodynamic treatments is impossible, so biodynamic farming is supplemented with other organic regimes. This disqualifies them from biodynamic certification, but does not mean that the winemaker is any less committed to the principles and fundamental beliefs of biodynamism. Becker’s wines include many from their extensive Grand Cru holdings, and can be obtained from Mayor Sworder, The Big Red Wine Company and Churchill Vintners amongst others. I am always keen to see a major cooperative cellar in any wine region I visit. Often the amount of investment and progressive thinking in evidence gives a clue to the general zeitgeist of the region. Here, in the immaculate, airy winery and visitor centre the dapper and alert M.D. Philippe Dry met me, and the omens looked good. 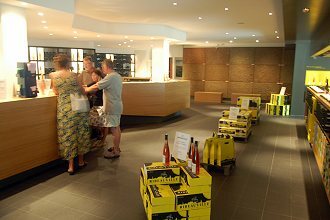 Philippe and winemaker Evelyne Dondelinger-Bleger showed me around the pristine cellars, with plenty of shining stainless steel, bladder presses and a bottling line pumping out screwcapped Riesling at a brisk pace. Around half of production is in screwcaps, cork being reserved only for their most traditional markets. The co-op is not biodynamic, but one of its 40 members is an organic farmer, and a major contributor, supplying around 10% of total production, for the organic ‘Terroir’ range of wines within the portfolio. This was an extremely impressive line-up of cooperative wines, showing pristine flavours and a very intelligent hand on the tiller of style and refinement. The large range covers sparkling, rosé, white, pink, red and sweet wines, but there is lovely consistency across the range. This model co-op has a lovely exhibition space too, where art shows change regularly, making it a ‘must visit’ if in the region. 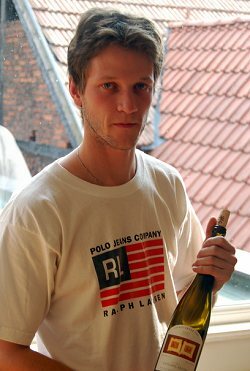 I had dinner with the shy but sharp-witted winemaker and owner of Domaine Albert Mann, Maurice Barthelmé in the excellent Michelin one-star ‘JY’s’ restaurant in Colmar’s ‘Little Venice’ district of canal’s and quaint narrow streets. That last sentence seems to lie at the core of belief for the most committed of both organic and biodynamic producers; that only by treating the grape with utmost care and respect can a great wine result from it. I was met in this beautiful old cellar in the middle of the village of Andlau by Marc’s son, Antoine Kreydenweiss, who has completed his winemaking studies in Burgundy to join the family team. The estate has been biodynamic for 17 years, making it one of the earliest adopters. 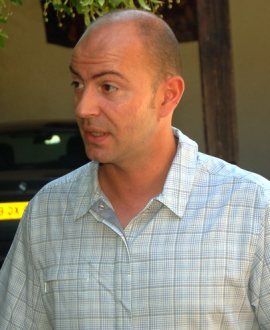 For the custodian of a family estate that was establish 350 years ago, Marc Kreydenweiss’s radical move to biodynamics is echoed in other areas that suggest an ambitious and restless approach: in 1999 Kreydenweiss took over an estate in Costièrs de Nîmes in the southern Rône Valley which is now also certified as biodynamic. Biodynamics appears to be a deeply held philosophy, rather than a commercial convenience for Kreydenweiss, who farm 12 hectares, including three Grand Cru sites. Around 80 per cent of the annual 70,000-bottle production is exported. The USA is their top market. In the cellar things are very traditional in this house, with the hand harvested grapes being crushed in modern bladder presses, but then fermented with natural yeasts in large foudres made from local Vosges oak. Antoine says his father experimented with barriques in the 1990s, but soon concluded it did not suit his wines, so they stick with the Foudres. They are also sticking with cork for now, but paying more and insisting on strict testing and certification from suppliers after a bad cork experience for their 2000 vintage. As well as a very natural approach to vineyards and cellars, Kreydenweiss is an arch believer in terroir, and Antoine talks with an inherited passion about the five different soil types found within the domaine’s vineyard sites, from the schist and granite of their Kastelberg Grand Cru, to the pink sandstone of the Wiebelsberg Grand Cru – the two sites separated only by the road that runs through the vineyards. Remy is a gentle giant of a man who farms his eleven hectares biodynamically. He is currently in the process of certification, but is one of many here who is also a pragmatist: “it’s pretty straightforward for me. I cannot always harvest on the fruit days (as opposed to the days for roots, leaves and flowers) because I don’t have the manpower or machinery to do so, and I can’t stop my next door neighbour who sprays his chemical treatments by helicopter – some of that must carry to my vines.” As if to illustrate this point, made as we were bumping through the vineyards in his Land Rover, we pass through his neighbour’s vineyard, where a worker in protective overalls and face-mask is spraying from a back-pack pump, the canister’s bearing the word ‘TOXIC’ in bold, black letters. Remy is also worried that Demeter, the international biodynamic organisation, is making a new rule on use of sulphur, that states the total sulphites allowed in a wine will be 150mg per litre, whereas now the legal limit is 400. 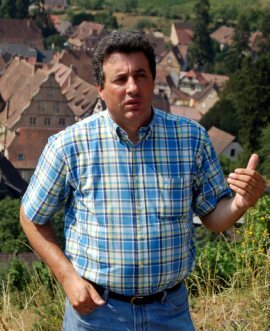 André Ostertag is one of the superstar producers in Alsace, who is as radical as his wines are excellent. His 14 hectares are all farmed biodynamically, and include over 120 different vineyard parcels covering five villages, from which he produces 17 different wines. Since 1984 André has rejected official classification and instead created his own: Vin de fruits (wines that he thinks do not express a specific terroir in green bottles); Vin des Pierres (‘stone’ wines in brown bottles – terroir specific wines); Vin de Temps (sweet wines in clear bottles, ‘Temps’ indicating both time spent on vine and the right weather conditions). This is a young estate, started by Andrés’s father in 1966. I arrived at the winery just as the heavens opened, so we retired to the tasting room without seeing the vineyards. Genevieve Barmes kept me entertained whilst husband Francois made his way back from the vineyards on his tractor. The 16 hectares of spreads over 70 parcels, and was founded in 1985. It has been fully biodynamic only since 1998, and they never inoculate with yeasts, don’t fine and don’t filter. As Francois says: “I do nothing in the cellar: I’m always outside in the vineyards.” They started a gradual process of conversion to organic and biodynamic in 1985, but say it took a while to build up the confidence to go fully biodynamic, especially with their neighbours saying “but your vines are dying!” when they saw the characteristically ‘unhealthy’ appearance of biodynamic vines against the pumped-up beauty pageant perfection of the average chemically treated vineyard. The couple say their principal motivation for the switch to biodynamics was Francois’s years of working with chemicals in vineyards: “I just realised that if they were dangerous to humans, then how could they be good for the vines and the wines?” Francois says he also remembers having problems with stuck fermentations, and having to add lots of sulphur to clean up wines. He realised there must be a problem with the raw materials in the vineyard. Today he uses one-third the sulphur that he used to. Again, there is more thoughtful tinkering with biodynamics here rather than blind acceptance: Francois racks wines made from fruitier grapes (like Muscat) on a fruit day of the lunar phases, and his more ‘serious’ wines like Riesling on a root day, believing that enhances the minerality of the latter. 2011: Tragically, Francois was killed in a farming accident soon after my visit. Brother and sister Jean-Paul and Marie Zusslin extend a truly warm welcome to their small cellar, which has been in their family since 1691 in the village of Orschwihr. Jean-Paul is in charge of winemaking, but with his father Jean-Marie and his 80-year-old grandfather are still very active – indeed both were busy on the sparkling wine disgorgement line at the time of my visit. 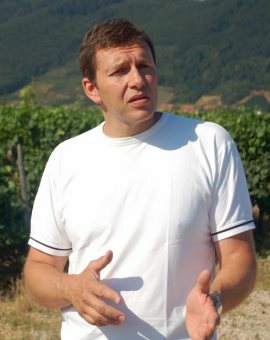 Jean-Paul is 13th generation to work this estate, which has been biodynamic since 1997. He says his motivating factor was concern about pollution and climate change, and a desire to stop using chemical. The estate is a members of Nicolas Jolly’s group Renaissance de Appellations. We drove up into the vineyards to see the biodynamic compost pile, a mound of rich, thick, friable and dry material. Jean-Peal picks grapes very late, often with two or three passes though the vineyard. Very long fermentation and ageing on fine lees follows, and there is no acidification or capitalisation, and only natural yeasts and Demeter’s charter on sulphur are followed.